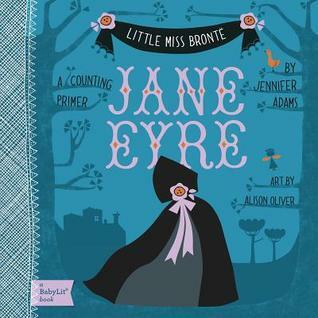 A few months ago, I got an e-mail about classics that were being remade into board books, which is a format targeted at infants and toddlers (hey, I didn’t know what a board book was until I began volunteering in libraires). 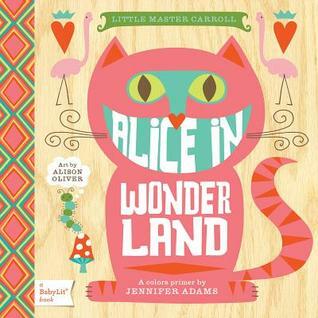 As someone who is studying for an MLIS and has been flipping through a lot more board books in the past year, I decided to jump on this BabyLit stories right away, and received copies of Little Master Carroll and Little Miss Bronte. These are perfect purchases for any parents who want to turn their baby into a total bibliophile. Little Miss Bronte is a counting book where as Little Master Carroll tackles colors and objects. Each of these books is nicely laid out and beautifully illustrated. Neither is too text heavy for an infant, and the pictures are nice and large. Little Miss Bronte counts some obscure objects that a baby might not see in his or her everyday life, like towers, but also includes items such as trees, chalkboards, and drawings. Of the two titles that I received, I actually preferred Little Master Carroll, because I simply adore the design of this entire book. The cover is stunningly bright and eye-catching, and I think that will attract parents. When you crack it open, each righthand page contains an adjective as a noun, such as “white rabbit,” and the lefthand page contains a picture of whatever’s just been described. The illustrations are absolutely stunning. Plus, one detail that I love is that on each righthand page, a pattern is lightly drawn on the background, such as flowers or stripes. In addition to preventing the book from becoming too plain, I think these illustrations offer further opportunities to teach vocabulary when flipping through this book with a young one. If you’ve got a baby in your life that you plan to buy books for, I highly recommend these titles. While kids will enjoy and cherish these unique books from an early age, they’ll love picking up these titles again as they grow up and read the novels that these titles are based on. Gibbs Smith, I applaud your highly successfully effort to create board books, and will be picking up the rest of the books in this series soon. What a charming and smart idea! I didn't know what board books were either until I started working in a book distribution program and was like, "Oh, that's what they're called?" Haha.